This family-run house consists of 5 apartments spread over 3 different floors and is located just 1.5 km from the center of Arabba (less than 5 minutes by car), right next to the Pordoi Pass, in a quiet location with a magnificent view. Furthermore, you can directly access the ski runs of Portavescovo-Pordoi via skis, through a narrow path in the woods (about 10 min. ): this means you can begin your ski holiday without having to use the car! The panoramic view faces the southwest. In addition to winter sports, this place is also suitable in summer for mountain bike excursions, motorbike tours in the Dolomites, and hiking along fantastic itineraries such as the Passo Padon, Marmolada pass, Sella gruppe and Monte Civetta. 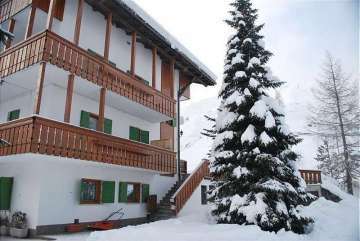 This second floor apartment for 2 persons is furnished in Tyrolean style. The double bedroom has a balcony. In the apartment there is kitchenette-dining room with fridge, and the bathroom has a shower. In the ski closet there is a ski boot dryer with automatic control. bathlinen and kitchen linen: on request.